aqua (water), ethylhexyl palmitate, carthamus tinctorius (safflower) seed oil, glycerin, butyrospermum parkii (shea) butter, cetearyl alcohol, fragrance/parfum, dimethicone, glycol stearate, polysorbate 60, aloe barbadensis (aloe vera) leaf extract, chamomilla recutita (matricaria) flower extract, cucumis sativus (cucumber) fruit extract, lavandula angustifolia (lavender) flower extract, prunus armeniaca (apricot) kernel oil, tocopheryl acetate, retinyl palimate (vitamin a), tetrahexyldecyl ascorbate (vitamin c), cetyl alcohol, caprylyl glycol, carbomer, ethylhexylglycerin, hexylene glycol, disodium edta, phenoxyethanol, sodium hydroxide, hexyl cinnamal, linalool, geraniol, lilial, citronellol, benzyl salicylate, alpha-isomethyl ionone, hydroxycitronellal, limonene, juniperus virginiana (cedar) wood oil, eugenia caryophyllus (clove) leaf oil, pelargonium graveolens (geranium) oil, citrus aurantium bergamia (bergamot) fruit oil, rosa damascena (rose) absolute. 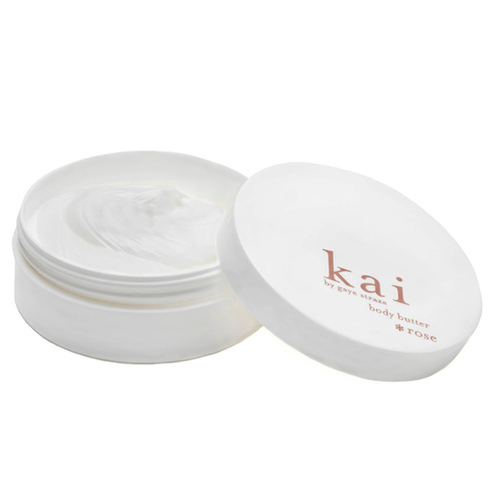 • Apply a dollop of body butter directly to your skin -- don't use too much or your skin could get greasy. Pay particular attention to your feet, hands, elbows, and knees, regions that tend to get particularly dry or calloused.